As part of a comprehensive effort to restore Minnehaha Creek, the MCWD worked with 16 Edina homeowners to restore approximately 2,000 feet of shoreline along a residential stretch of Minnehaha Creek. Work wrapped up in 2013. "Reach 14" of Minnehaha Creek is a three-quarter of a mile stretch of creek from 54th Street to France Avenue -- an area identified by a 2004 study as having poor habitat for aquatic life due to warm, shallow water and lack of vegetation. 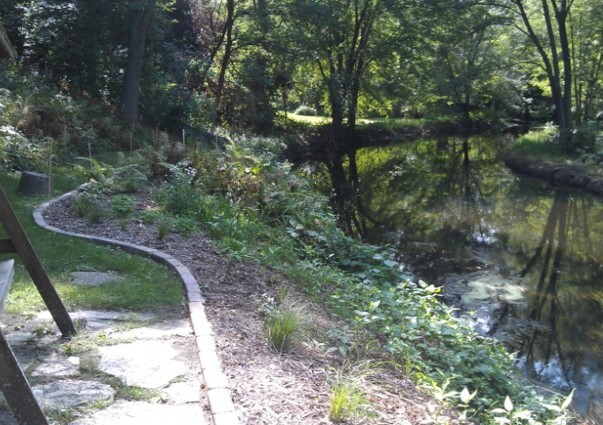 Since the creek is bordered by private homes, many of which have turf grass or large rocks along the stream bank, the MCWD saw an opportunity to improve the creek's eco-system by working with homeowners to add plants, shrubs and trees along the water's edge. The project transformed the creek's appearance and the new plantings prevent erosion, catch and filter polluted stormwater, and provide habitat for wildlife. The natural landscaping also looks beautiful and deters geese. Many of the residents who participated in the restoration helped design their new landscape, which the District funded and will maintain for three years to ensure successful establishment. In the future, the District plans to install signage upstream of the restoration informing the public about the project. It's hoped others who see the newly planted streambanks, including the countless canoeists who pass by during the spring and summer months, will appreciate their beauty and environmental benefits and consider doing similar work on their own property.